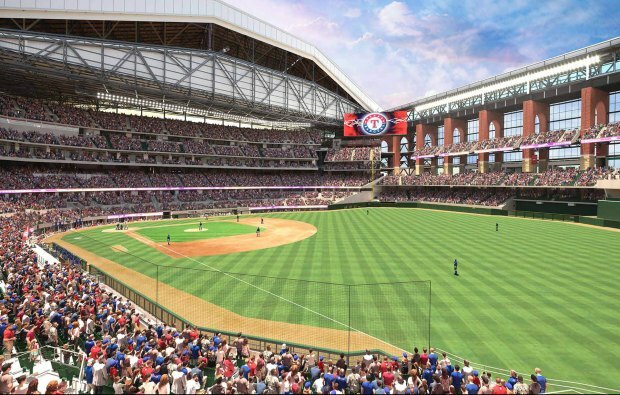 In what has become an annual tradition, the Texas Rangers Monday unveiled new concession offerings available to fans attending games at Globe Life Park this season. Among the highlights, a 2-lb chicken strip (whoa! 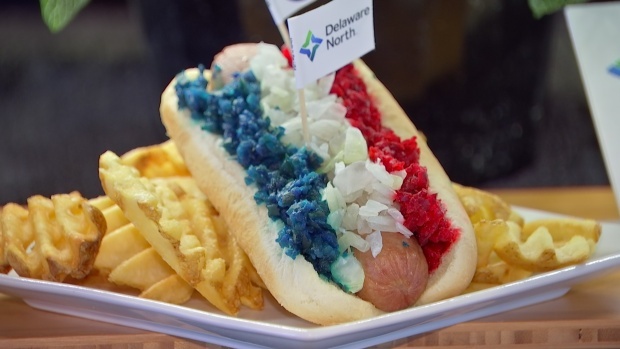 ), vegan offerings including a burger and street tacos, and the visually striking RWB dog -- a ballpark frank lined with red and blue relish. See the full concession and club menus below ... photos of many of the items are available in the slideshow immediately below. The Fowl Pole ($27.50) – A Chicken Strip like you have never seen before! A 2-lb chicken strip hand-battered and fried to crispy perfection. Served on a bed of waffle fries with honey mustard and ranch dressing. Located in the Budweiser Bowtie Plaza Flew the coop stand at section 50. 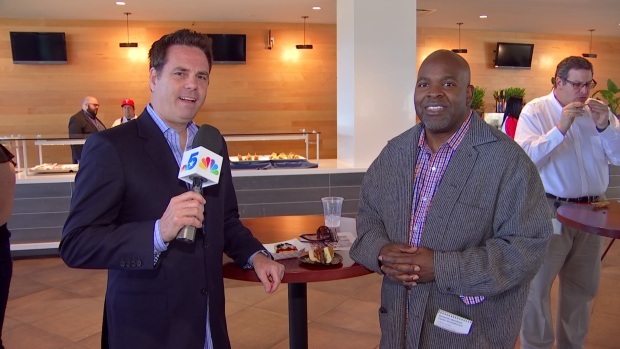 NBC 5's Newy Scruggs and Paul Jones check out this year's new food offerings at Globe Life Park for the upcoming Texas Rangers season. The RWB (Red White & Blue) Dog ($11) – Using Best Maid pickles, we created a combination of Savory, Sweet and Spicy Glorious Gherkins relish in Texas Rangers Red, and blue colors on a plump Texas Chili All Beef Hot Dog. served with Lays Chips. Located at the American Dog Stands at section 22 and 48 and Eat More Dawgs Stand at section 36. Street Tacos ($12.50) – Three street tacos served on corn tortillas with your choice of Al Pastor, chicken or brisket. Served with cilantro, feta cheese, diced onions and a lime wedge. Available at the Casa De Fuego Section 25. Bacon Wrapped Wings ($10.75) – Everything is better when you add bacon. Chicken wings hand wrapped in bacon and deep-fried until crisp. Served with fries. Available at the Fry Depot at Section 9. Vegan Street Tacos ($10) – Three Corn tortillas with seasoned Beyond Meats vegan crumbles topped with fresh Pico de Gallo. Available at the Ballpark Vegan Stand at section 16. Commemorative Soda Stein ($20)– A unique collectable cup to commemorate the final season in Globe Life Park. Refillable for $1 for the entire 2019 season. Available most concessions locations (while supplies last). Grilled Chicken Salad ($7.50) – Fresh grilled chicken breast sliced over a bed greens, topped with tomato, onions, croutons and your choice of dressing. Available at the Butcher Block stand at section 24. Fresh Veggie Wrap ($10) – Squash, zucchini, carrots, tomatoes and lettuce with Italian dressing wrapped in a tortilla. Served with chips. Available at section 22, Centerfield Market and 214. Belgian Waffle Sundae ($13.50) – Freshly made Belgian waffles topped with your choice of two scoops of Blue Bell ice cream and traditional sundae toppings. Available at the Ice Cream Stand at section 23. Right Field Bacon Bombs ($11) – Not your average cheese stick. Provolone cheese wrapped in strips of bacon. Deep fried until crispy perfection. Served with Sweet Baby Rays BBQ Sauce. Available at The State Fare Stand at section 41. State Fare Corn Dog ($11.75) – A foot long 1/3 pound Texas Chili hotdog dipped in our house made batter and fried to perfection. Served with fries. Available at the State Fare stand at section 41. Breakfast on a Stick ($8) – Breakfast that’s delicious any time of the day. Breakfast sausage links wrapped in bacon and then battered and fried until GBD. Served with pancake syrup for dipping. Available at the State Fare Stand at section 41. Fried PB&J ($10) – Your favorite sandwich taken to the next level. Two crustless peanut butter and jelly sandwiches deep fried until crispy on the outside and perfectly runny on the inside. Available at the State Fare Stand at section 41. Fantastic Family Meal ($27.50) – Feed the family with three of your favorite offerings. 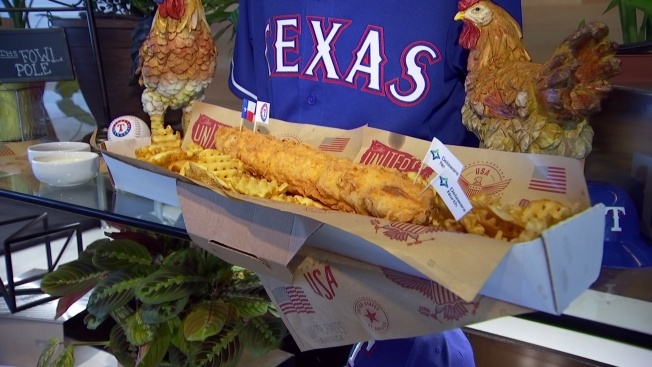 Ballpark Jumbo Dog, footlong corndog, and chicken tenders served with a Texas-sized portion of fries and dipping sauces. Available at the Chicken & More Stands in sections 21 and 31. This season’s menu highlights some “Globe Life Park Fan Favorites” as we celebrate the last year in Globe Life Park. Baja Fish Tacos ($13) – Chili Rubbed grilled tilapia, pickled slaw, sriracha aioli and cilantro. Steak Sandwich ($16) – Ribeye steak with sriracha aioli, fried onions and served on ciabatta bread. Grilled Chicken Sandwich ($13) - Grilled chicken breast topped with sautéed onions, provolone cheese, applewood smoked bacon and sriracha aioli. Texas Style Cobb Salad ($14.25) – Chopped greens, avocado, diced roma tomatoes, chicken, grilled poblanos, bacon, chives, queso fresco and ancho chili vinaigrette. Texas Burger ($15) – ½ pound burger with American cheese, fried onions, applewood smoked bacon and Rebecca Creek Whiskey BBQ Sauce. Ice Cream Sundae ($9) - Blue Bell Vanilla Bean ice cream scoop topped with candied walnuts, dark chocolate shavings and caramel.